Feather was born in 2006, kept as a pet for several months by the people who found her and, eventually taken from them by the Arizona Game & Fish Department. 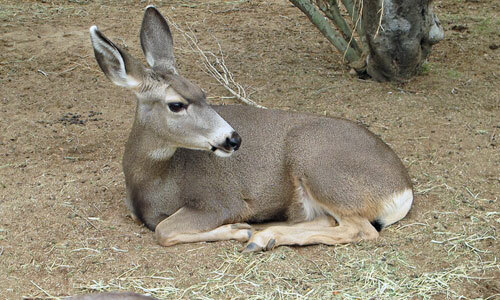 Deer which have been captive cannot be released in Arizona because of the risk of spreading Chronic Wasting Disease to the wild deer population. Chronic Wasting Disease is a neurological disease in deer which affects the brain and nervous system and causes them to stop eating. The disease is devastating, but fortunately, Feather doesn’t have it. 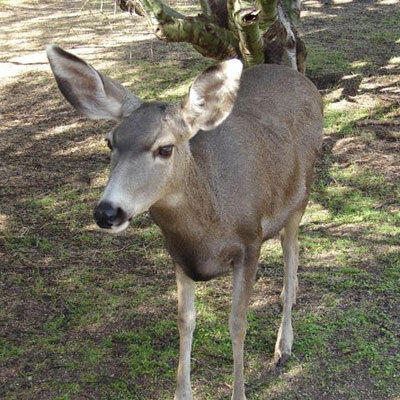 For many years Feather was the only deer at Southwest Wildlife and enjoyed her starring role. These days she's sharing the sanctuary with Lou, a mule deer buck, three mule deer does (Clover, Summer, and Suri), and a Coues white tail doe named Nalani. Feather is still our favorite (don't tell the others! ), and is spoiled with plenty of fresh greens, fruits and veggies by her fan club of volunteers and staff.